In September, I wrote an article on the opposite lead-lag roles of the financial and energy sectors. Historically, the former has been a leading sector or first to move while the latter has been a lagging sector or last to move - both in up trends and down trends. 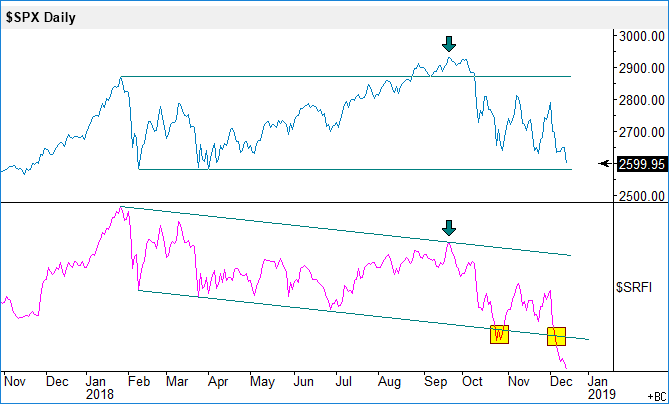 The first chart shows the S&P 500 index in the upper pane and its financial sector index in the lower pane. The financial sector is down 13.6% for the year while the parent index is down 2.8% year-to-date. 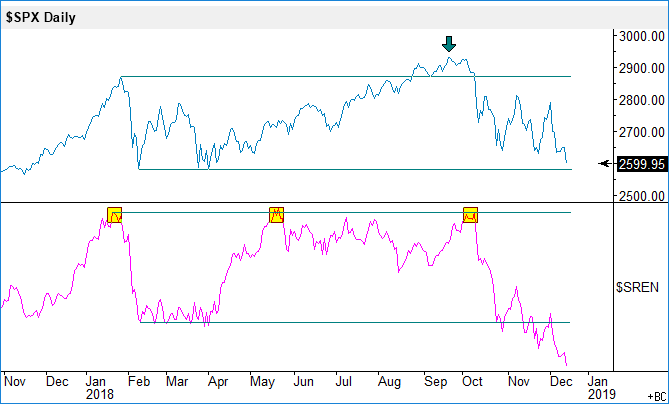 Also note that the broad market topped out in late September while financials reached their top in late January. In late October, the sector made new one-year lows and again last week. The second chart shows the energy sector index in comparison to the S&P 500 index. The energy sector is down 14.5% YTD and has been making a series of new one-year lows after making a triple top.